One of the most popular North American wild edibles, the ostrich fern produces tight spiral fiddleheads in spring, widely considered a delicacy. Samuel Thayer, in his excellent ‘The Forager’s Harvest,’ maintains that the best parts of the ostrich fern to eat are the straight stalks below the coiled tops, when they’re about 8-12″ in height (he enjoys the tops, too). Simply cook them for 5 or 6 minutes. Ostrich ferns make a good ground cover in the shade, and they like wet feet. 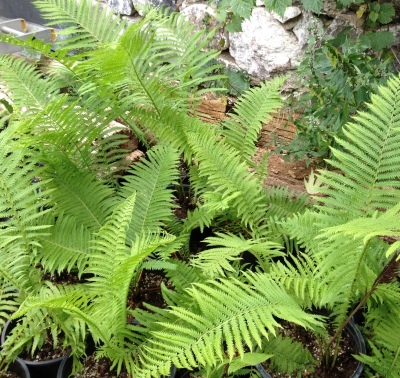 Ostrich ferns can be easily over-harvested; pick only two or three stalks per plant. We grow them in our gardens as ‘indicator’ plants, which tell us when the wild ones are ready (there are acres of these delicacies growing wild nearby).